K-Seal will permanently fix most leaks in your vehicle’s radiator or its casing. Can K-Seal Fix My Radiator? K-Seal will permanently repair and fix most leaks in the radiator or radiator casing. Although the radiator may be one of the cheaper components in the car engine it can still cost hundreds to have it repaired or replaced. Just one bottle of K-Seal could save you a lot of money by fixing an engine coolant leak instead of you having to replace the parts. What are the Symptoms of Radiator Failure? The most common symptoms of radiator failure relate to coolant leaks. You should check your car radiator’s water or coolant levels every two weeks or so. On most cooling systems, there will be a visible maximum and minimum level indicator that car owners can use to judge the level of coolant – ideally it will always be between those two marks. Coolant levels will decrease naturally, but a large drop over a short space of time will indicate a car radiator leak. If you’re willing to keep topping the radiator up and the symptoms don’t worsen, your engine will keep running for a time, but eventually the engine will break down. Strictly speaking, you shouldn’t drive at all once you’ve discovered one of these symptoms. How Much Will Radiator Repair Cost at a Garage? The cost of flushing a car radiator will vary depending on whether you do it or employ a mechanic to do the job professionally. If you do it yourself, you’ll be able to keep costs down and just pay for the new coolant, which should be around $50. If you go to a mechanic, the cost will be around $90 depending on your car make and model. Want to get hold of a bottle to fix a leaking car radiator? Search for a K-Seal stockist and get back on the road – fast. Unlike a radiator in a building, which is needed to increase the temperature of its immediate surroundings, the main function of a car’s radiator is to cool the internal combustion engine that powers the vehicle. 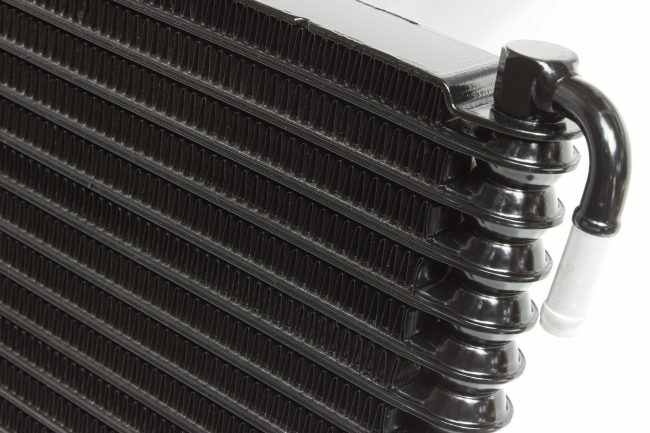 The radiator is designed to remove the heat generated by the engine to the air in order to regulate the engine temperature and prevent overheating. If the engine overheats then it will stop working and have to be replaced, which may be more expensive than simply buying a new car. It is important to understand how a car radiator works so that you know how to identify any problems that might affect it and the car as a whole. An engine needs to burn fuel to run, a process which naturally produces an immense amount of heat. This requires the engine to be cooled as much as possible so that the pistons do not break down and destroy the entire system. This is where the radiator, which is part of the engine’s cooling system, comes in. The coolant in an engine is passed through tubes inside the radiator, where heat it has absorbed from the engine is dissipated into the atmosphere, before the coolant returns to the engine. Coolant enters the pipes in an overheated state, causing it to become highly pressurised (aided by turbulence inside the radiator pipes), at which point the radiator cap opens at a predetermined pressure point. This releases the heat and allows any excess coolant to escape into an overflow tank attached to the side of the radiator. That coolant is then returned to the radiator when its temperature has sufficiently lowered. Although there are slight variations to the radiator and cooling system in general from model to model (especially in older cars versus newer models), this is the process that the majority of systems employ, and knowing how they work will help you when it comes to diagnosing any issues that might occur with them. Why Do Car Radiators Fail? The main reason for radiator failure is a leak, which can lead to the cooling system failing. If the coolant has not been checked or topped up properly the inside of the system will begin to rust and become clogged. Corrosion will eventually result in small holes developing. This will result in engine coolant loss, and a need for car radiator repair. Although your radiator could be the source of your engine troubles, it might not be the only component you need to take a look at. Select an engine part in the interactive diagram below to explore your engine and the important components that keep everything ticking over.